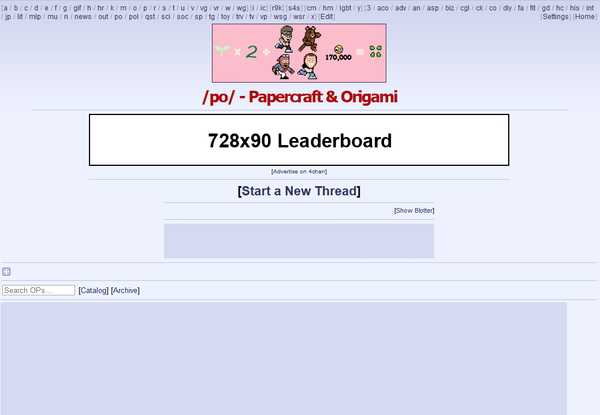 4chan is the original and largest English-language image board with over 22 million monthly visitors worldwide. Our boards cover a wide array of interests, including Video Games, Anime, Television, Film, Comics, Technology, Fitness, and Cars. Advertisers have the option of displaying their ads across the entire site for huge reach, or picking and choosing boards to target their audience's interests. We offer managed campaigns on a CPM or flat rate basis. Our managed campaigns feature advanced capabilities such as geo-targeting, frequency capping, road-blocking, and detailed reporting. For more information about managed campaigns, please e-mail e-adv@4chan.org with details about what you'd like to advertise, your budget, and flight dates. A representative will respond to your inquiry as soon as possible. Banners will be placed in site-wide rotation on 4chan.org with no special targeting. Free advertising is only available to bona-fide Anime & Comic Book conventions. Ad impression volume is subject to availability and 4chan's discretion. Advertising service provided as-is. We make no guarantees about ad performance. 4chan reserves the right to decline your request for free advertising at its sole discretion. 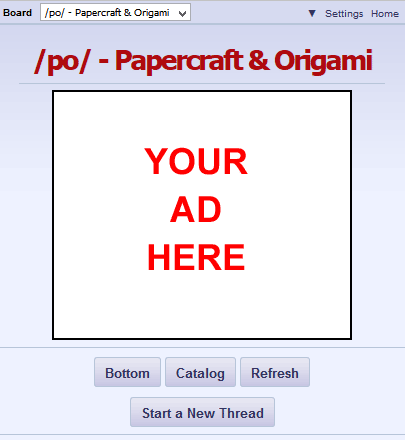 Please send your request for free convention advertising to advertise@4chan.org along with one 720x90 and/or one 300x250 'work-safe' banner image, and your convention's webpage address. We're glad to help your convention get the publicity it needs to be a huge success!